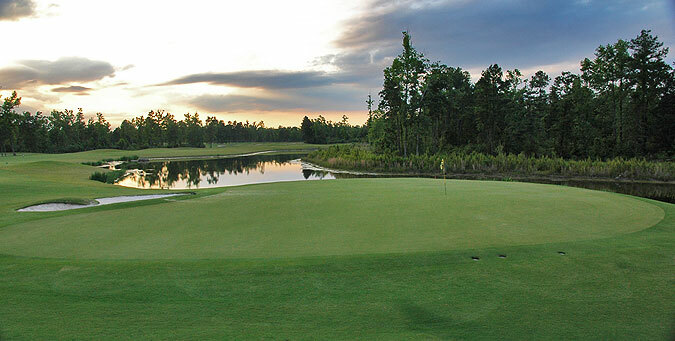 Wood Forest Golf Club is a premier 27-hole championship facility that is located an easy 15 minute drive from the Woodlands Resort (and just 1/2 hour from Houston). We were quite frankly surprised that this course was not to be found in the Golf Digest 2006 edition of Places to Play - as if you are talking about Houston area golf - this is definitely one of the area's best - and a MUST PLAY for visitors to the area. The photos in this review and most of the info provided are of the front and back nines, as we did not have the opportunity to tour the West nine. We found these two 9-hole layouts to be wonderfully sculpted from the natural rolling terrain, with exquisite conditioning that features TifEagle putting surfaces and 419 Bermuda fairways. The tee areas and sand bunkers are wonderfully sculpted, and the fairway mounds and moguls give this (PGA Champion) Steve Elkington design some distinguished character. Most of the holes are lined with stately pines and hardwoods, but there are usually generous landing zones off the tee. The expansive putting surfaces are often framed by soft sand bunkers with perimeter mounding and grassy swales. The surfaces range from fairly flat to extremely undulating or tiered. Again, there is often ample recovery room for up and down opportunities. The surrounding golf environment is serene, secluded and absent of any residential or commercial development. In total there are approximately 65 soft sand bunkers (on 27 holes) sculpted into the fairways or greensides - though due to the size and intricate shapes, there seems to be many more. Water features are understated but beautiful nonetheless, with hazards in play on 7 of the 27 holes. Four sets of tee boxes are provided, and play to slopes ranging from 130 to 114. The front/back nine play to yardages measuring 6836, 6516, 6197 and 5293 yards - with the forward tees taking much of the trouble out of play. The course is well marked, with 150 yard stakes plus sprinkler heads that are measured to the front, middle and back of the green on all par fours and fives. 100, 150 and 200 yard blocks (and 250 on par fives) are also located adjacent to the cart paths, and pin placement sheets are mounted on the carts to indicate the day's hole locations. On property is a gorgeous and extensive practice facility with targeted grass range, short game area with sand bunker plus large putting green. The clubhouse features a nicely stocked pro shop plus dining area/lounge serving lunch items and beverages, with daily specials. This property is expertly cared for with manicured playing surfaces and aesthetically pleasing landscaping. Some experiences are worth the drive, and Wood Forest certainly fits into that category! Highly recommended. For more info, visit our page for the course, with direct link to their website by clicking here.